Medications were taking over my refrigerator. Syringes, extension tubes, alcohol wipes, injectables, sharps containers, and needles were taking over my kitchen counters and cabinets. Tube feeding formula, feeding bags, and gauze were taking over the bedroom closets. When it was time for medications and or/tube feedings, I was running from room to room to gather the necessary supplies. It was out of control and frustrating. My husband, Nathanael, and I went to the local Habitat for Humanity ReStore and found a beautiful cabinet for a very reasonable price. We got it home, cleaned it up, put it in the dining room, and prayed that everything would fit in it. Nathanael dug his old college dorm mini fridge out of the basement and I picked up a couple of plastic storage drawer units. We placed a hook on the inside of one of the cabinet doors to hang the tube feeding backpack when not in use. On the other door, we hung PT/OT exercises, a medication administration list, and a seizure protocol for family when they came to help. Into the cabinet went the mini fridge, the drawer units, and even the microwave (because there was some empty space)! 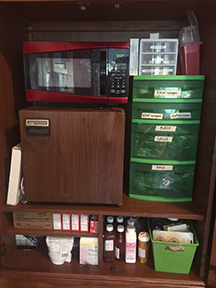 We labeled all the drawers and used the cabinet shelves for the formula, non-refrigerated medications, and other random health-care items that we use daily. The mini fridge holds all the refrigerated medications. Finally, all medical supplies were in the same location. No more running to different rooms to collect needed items, and I had my counters, kitchen cabinets, and refrigerator back for their intended purposes!